My colleague Deb Brown recently posited her view on a Fast Company piece arguing that nice bosses finish last . As Deb notes, the article is less about mean bosses being more successful and more about the importance of being direct and, if necessary, tough in order to succeed. Deb thinks one can be nice and successful at the same time. I don't agree. I think it's more important to be direct and honest, to the point of being blunt if necessary. I believe employees want clarity. They want to be led. They want someone with a vision who can clearly communicate it. Once that's been accomplished, one can add a spoonful of sugar. Employees also want a leader who isn't afraid to fire underperformers. Nice bosses want to be seen as one of the guys (or ladies). They shy away from sharing bad news. They let consensus rule the roost until inertia sets in. Most importantly, they want to be liked (as opposed to being focused on building the best business possible). All of this can be done with a smile and, as Deb suggests, by showing vulnerability. But, decision-making isn't for the faint of heart. And, I agree with the Fast Company POV that tougher, more direct bosses do better than their weaker, sweeter counterparts. – As was the case with the Green Bay Packers players coached by legendary mean guy, Vince Lombardi, I pushed myself to the absolute limits to achieve results my a**hole boss thought impossible. Do I like working with nice people? You bet. Is respect in the workplace critical? No doubt. But, give me a tough, direct boss any day of the week. Save the consensus thinking for the Beltway (which, BTW, is how our country got in the fix we're now in: a dearth of tough, decisive leaders. Where's Harry Truman when you need him?). Julie: As RepMan’s official “decorator,” I thank you. 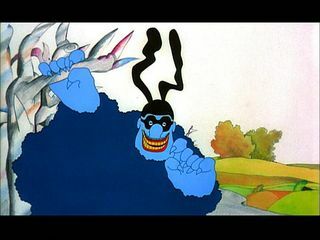 I like the Blue Meanie graphic in this blog post… And he turned out to be a nice guy in the end. I suggest you update your resume, Deb. How’s that for being direct? I agree with both Sam and Bubbles. Touche to you both! Perhaps. But, it still comes down to nice vs tough/direct and, unlike Deb, I think tough/direct wins the day and agree with Fast Company that the most successful executives are the ones who make the tough, direct decisions without the niceties. I disagree with your disagreement, Bubbles. Mario, in fact, has free reign to do whatever he wants in training me. He could decide, as some trainers do, to spend his time texting friends and occasionally watching what I do. Instead, he changes each and every session, varies to cardio vs boot camp elements and always raises the bar. That’s what a great boss does. And, there’s nothing nice about it. But, it’s liberating, challenging as hell and ends up making one a better professional for the experience. Thanks Sam. Great analysis. Now, let’s see if Deb agrees. If she doesn’t, I’m prepared to fire her. Rep: Sorry, but I think it’s wrong to compare a business manager to a personal trainer who YOU ARE PAYING to get visible, tangible, physically measurable results that you have specifically requested. Mario is being paid to do what YOU want him to do. You have specifically asked him to push you- do what he has to to motivate you. If he doesn’t do that, he doesn’t get paid. Vastly different from your employer who is paying you to perform. I think the difference is a different definition of nice. When I think of someone being nice, I think of people not being unnecessarily cruel, being empathetic to the other person and handling things in the kindest way possible, etc. Where I think the disconnect here is that Steve is talking about people who are overly concerned with being perceived by others as nice. This reminds me of the discussion about whether happiness in the workplace is important or not. If you just do everything you can to make people happy all the time, then the workplace will be dysfunctional. (“So, you want to leave early? Sure! Whatever floats your boat.) And, similarly, people who are so concerned with being perceived as nice that they’ll never deliver news that’s tough to hear will have a problem. But, while I don’t think a leader can be obsessed with perception, I think a leader can be nice and be a successful leader. In my mind, being nice includes being direct…courteous while doing it, but direct. Steve, you’ve passed along feedback to me in the past that I didn’t necessarily like hearing but needed to hear. Had you not passed it along to me, I’d wager it wouldn’t have been very nice you. It would have left me ignorant to feedback I needed to hear. Someone who is driven by being nice rather than wanting to be perceived as nice will have the tough conversations but do so in the most respectful way possible. I will counter one thing, though, Steve: I’ve worked for nice people, and I’ve worked for jerks. (And, to be clear, I firmly include you and Ed in the “nice” camp, potentially much to your chagrin.) The nicer my boss has been (at least by my definition of nice), the more motivated I was to work for them. If I saw them displaying a collaborative spirit, rolling up their sleeves and working hard, etc., it motivated me to work as hard as they did and to pleasing them. When I’ve worked for a jerk, it’s motivated me, too…motivated me to find another job. Let me explain my POV in a way you’ll understand, Deb. We both train with Mario. I don’t know about you, but he pushes me beyond my limits and does so in a direct, sometimes harsh way. He doesn’t coddle me or play the nice guy when I ask him to ease up. Instead, he pushes me even harder to excel. That’s what great leaders do. They push you past your limits. I wouldn’t want a nice trainer or a nice boss. I want someone who will keep challenging me to excel. The pat on the back, nice guy feedback comes later in the process. I still think you’re wrong Steve. You can still stand your ground, make decisions, and deal with various personalities while being respectful, approachable, and pleasant. I disagree, Deb. And, you’re fired by the way. I can think of one competitive agency that is warm and fuzzy that you’d think they’d be featured in a Disney movie. But, former employees tell me they’re completely dysfunctional and suffer constant turnover precisely because management is too nice to be tough. I’m from the Nick Lowe ‘Cruel to be kind’ School of Management. By the way, niceness can also get in the way of managing an abusive client relationship. Be too nice and an abusive client will destroy the morale of your team. Stand your ground and, while you may lose the client, you’ll earn the respect of your employees. I disagree with you, Steve. You (well, maybe not you) can be nice and direct at the same time. Think of constructive criticism. It’s direct, but it’s all in the delivery. You can have a nice tone and be respectful while helping someone understand how he/she can improve. I competely agree with firing underperformers, and I’ve fired employees in the past, but that doesn’t mean you have to be tough about it. I think the carrot is a much stronger motivator than the stick.